The origins of the name of this pub apparently lie in something of a mistake (well, sort of). Located at 10 Bridge Street on the corner of Canon Row – just across the road from the clock tower at the north end of the Houses of Parliament, its name apparently lies in mistaken belief that the tower was named St Stephen’s Tower. It never was, at least not officially. Prior to recently being renamed the Elizabeth Tower – in honour of Queen Elizabeth II’s 60 years on the throne, the tower, which contains the bell known as Big Ben, was simply known as the Clock Tower (another common error has been to call the tower itself Big Ben). The name St Stephen’s Tower apparently was the fault of Victorian journalists. They had the habit of referring to stories relating to the goings-on in the House of Commons as “news from St Stephen’s” because MPs, prior to the destructive fire of 1834, used to sit in St Stephen’s Hall (the entrance to the hall can be found down the road opposite Westminster Abbey). 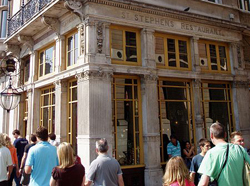 Hence we have St Stephen’s Tavern, a favoured watering hole of many politicians – including apparently PMs Stanley Baldwin, Winston Churchill and Harold MacMillan. The pub has been around since at least Victorian times – it was demolished in 1868 when Westminster tube station being built and rebuilt a few years later. In 1924, the pub was expanded to take over the Queen’s Head next door. It closed in the late 1980s but was reopened in 2003 with many of the original fittings restored. These include one of only 200 parliamentary division bells, located above the bar, which calls MPs back to parliament when it’s time for them to vote (tourists apparently often think it’s a fire alarm and flee when it goes off).